The history of Espace includes five different generations from 1984 to 2004. Twenty years on the market! The evolutions from generation to generation is very interesting. Read about it here. Espace was concieved as the successor of the Rancho, which Matra developed and manufactured in coorporation with Simca/Talbot in the late 1970's. Rancho was a mixture of todays SUV's and Citroen Berlingo. Rancho is important in this connection. It doesn't look like Espace, yet it was the foundation for it! We must remember that it was while Matra manufactured it, that Philippe Guédon - the fater of Espace - during a jurney in the USA i 1978 got the idea that he could give the large American vans a European twist. 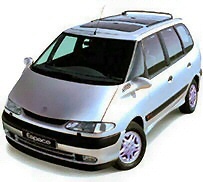 The first Espace prototype was built on the Simca 1508 platform. It had independent suspension in the rear and transversely mounted engine. It did not have the flat floor which later has becom one of the most important properties of Espace, and the individual chairs were not "invented" yet either. A later prototype, P18 was presented in 1980 on the Mortefontaine track to Sochaux of Peugeot (which Simca was now part of in the PSA group), who during the presentation was silent, but after some days returned and told Matra that such an vehicle had no future! They did not want to market it with Matra! Matra then approached Citroën, but they responded that they did not need others to design cars for them! A foreign partner was also thought of: BMW. That it became Renault, who in the end chose to say yes to take the car in it's collection is something that we can be happy about today. Renault has done a fine job with marketing and even developed a whole new class of cars over Espace in the 'Scénic'-segment. Espace is very french, very Matra and a great deal Renault! The original edition of Espace from 1984 was built on Matras factory in Romoratin near Paris. 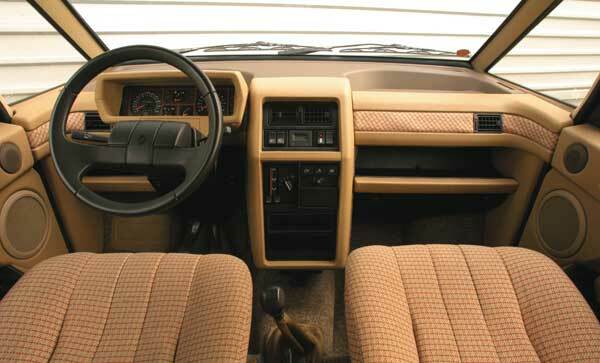 It replaced the previous Matra model Murena on the production lines. Murena was sold under the Simca/Talbot brand. 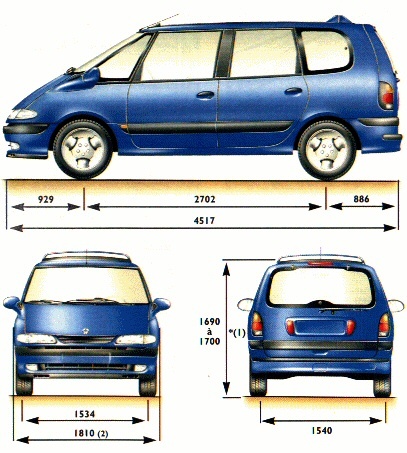 The original Espace is known by its length (it is somewhat shorter than the 1988 variant) and by the forward sloping headligths. In the year of 1984, no more than 400 Espace's rolled off the assembly line. The first month saw sales of no more than 11. Measurements of Espace phase 1 1984-1987. Measurements marked by asterisk is for diesel edition. 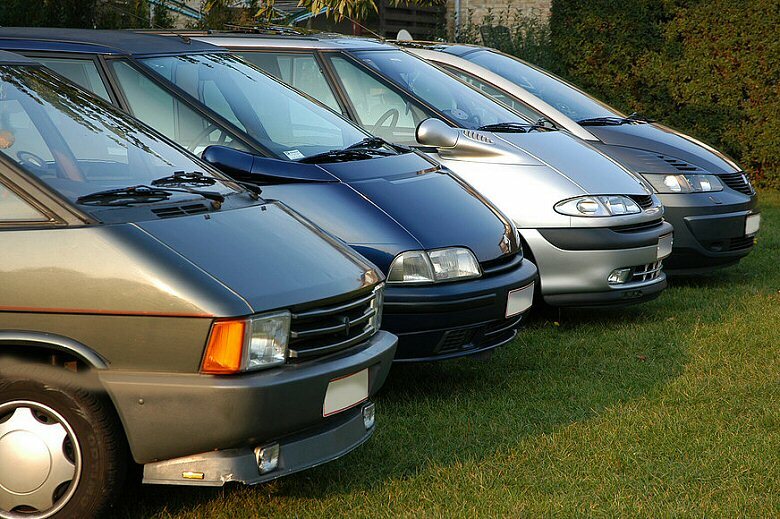 When the face-lifed phase 1 was launched in 1988, the succes was safe and the market yet free from competitors, except from the American players: Espace was the market leader in a new and growing market for comfortable family cars. The differences between the two editions are small: The vechicle was extended somewhat in the back, by which the space inside was increased. The front was also changed and got a somewhat more Renault-like look. Also a less original look, by some's opinion, but that is a matter of taste. Phase 2 was technically a phase lift of phase 1. Engine layout was still the same and suspension, wheel base, chassis measures and drive line was largely or completely unchanged. Some adjustments were made to the front suspension, similar to those made between in 1988, but still implementing the old double-wishbone system. The exterior and interior was highly updated, and the sense of quality was increased a lot. 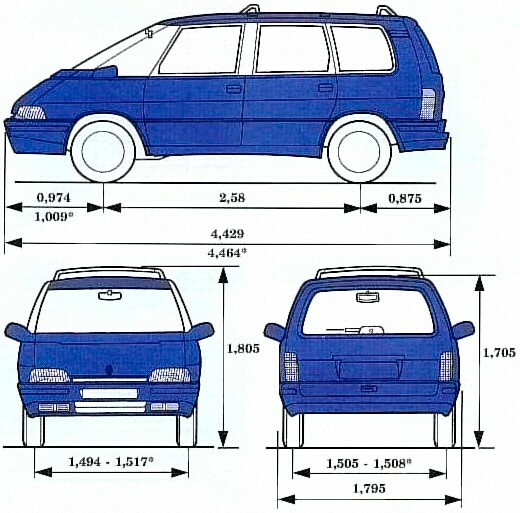 The side mirrors were moved to the front of the wind screen edge, a unique feature of an MPV. 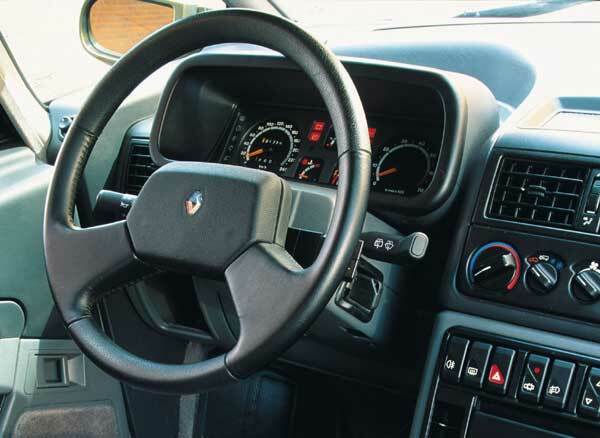 The phase 3 dash board reproduces the lines of the original phase 1 but has a more robust and finished look and feel to it. 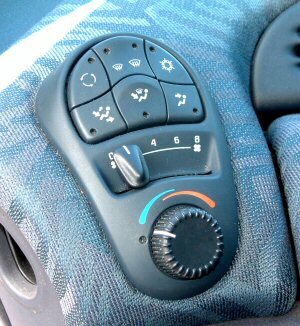 In the cabin, much better sound insulation makes the jurney more comfortable, and air-condition is now found on most models. The lousy heater blower fan of phase 1 (somewhat improved in phase 2) is now history, and while not reaching the level of the phase 4, is very good and fully sufficient! The good looking and very functional rear seats with head rests sliding into the seat to prevent rear view blocking when not in use were introduced. And the PRV V6 engine entered the picture, making Espace a very fast car indeed! Electronic ignition and catalytic converter placed it at 150 bhp, and for a car weighing only about 1300 kg, it's a great deal of power per kg. 4 WD introduced in phase 1 after the face lift continued in phase 2 with the J7T 2165 ccm petrol engine, but still with the energy consuming wiscous coupling and no possibility for disabling it entirely when not needed. The J8S 2068 ccm turbo diesel engine also continued. Phase 3 was launched in 1996, but apparantly didn't start volume production until 1997. Compared to the previous models, the Phase 4 marked the end of the longitudally mounted engine mounting, as the entire system of engine, front suspension, steering etc is shared with the Laguna. Also the portfolio of engines was changed, new was the 2.0 gasoline and 2.2 turbo diesel. 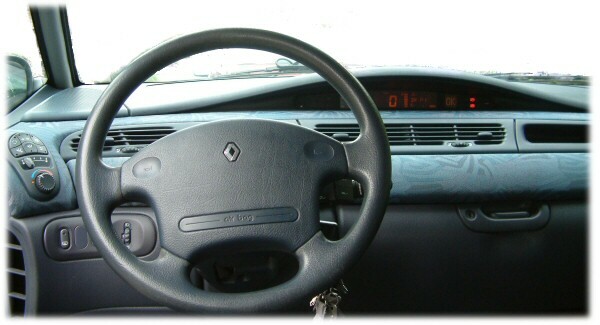 The 12 valve 90 degrees V6 was, reused, but only until model year 1999, where it was replaced by the 24-valve 60 degrees V6 engine technology that Renault is still (2004) employing. The design of Phase 4 broke new grounds with it's futuristic elements. Today it is still unique. The exterior made it more masculine and powerful in apperance. Air intakes in the side mirrors was not seen before, and hasn't after. As on Phase 3, the side mirror are mounted all the way forward by the wind screen. The interior is dominated by the large central display. One thing that has contributed much to making Espace such a famous car, was that Espace phase 4 was the first car in history to be awarded four stars in EURO NCAP's collision test. Please refer to EURO NCAP test result. Udstyrsliste for årgang 1997/1998 type RT og RXE - reference til at sammenligne udstyret i Espace'r i disse årgange. Det ser dog ud til at listen ikke passer helt, fx har min Espace RT sæder med velours på fronten og kabinelys også på tredie sæderække, hvilket kun RXE burde have. Avantime means something like ahead of it's time, and Avantime is still just that. Not yet a cult-car, but conceptualised as such from the beginning. Built on a strongly modified JE chassis by Matra in galvanised steel with glass fiber body, and with re-use of many parts from the JE: Suspension, display, design elements. 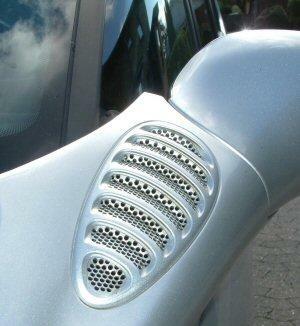 The design is not so much of the very simple and beautiful, now we are talking about a car that shows it's muscles. Avantime attracts attention from the people around it. This vehicle is not made by Matra, but by Renault themselves on the same plant where Laguna and Vel Satis are made. It shares design elements with previous models of Espace, but not the construction: This verison of Espace is made of steel, not galvanized steel and glass fiber. Because of that it is much heavier than phase 4.